In these complex times, we are bombarded by more stimulation than ever before in the history of the world. We need to make more choices in one day than previous generations made in their entire lifetimes. In addi- tion, the world in which we live is constantly changing, daily, hourly, and moment to moment. Technological changes alone can make your head spin. Mergers and acquisitions are forged in private and change the way we do business, and terrorist attacks shatter our peaceful existence leave us in shock and deep pain. he changes include but are not limited to: environmental, political, economic, scientiic, medical, and global. In ad- dition, we also must contend with task-saturated lives in which responses to a myriad of requests and demands are expected in nanoseconds; there is less and less time available to sort or process information and data and deal with disillusionment, disappointment, and dismissal. In short, there appears to be less time, higher expectations, and a plethora of elec- tronic devices demanding immediate attention requiring instantaneous responses to a variety of questions, requests, and challenges. 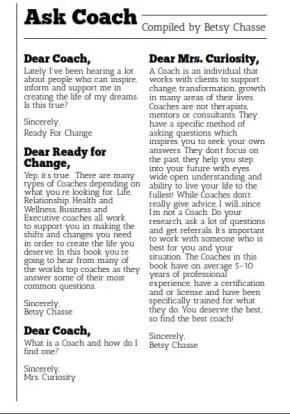 Click “Ask Coach” to download free PDF! Coach Michael is on Page 11!